Hello everyone! Hope you are in the pink of health. Teamie android app update 3.3 is out and we would like to share its details with you. This app update redefines how you would now consume the lesson resources on Teamie Android app (don’t forget to update your Teamie Android app). In order to enhance user experience, we decided to revamp the lesson landing screens for both instructors and learners. 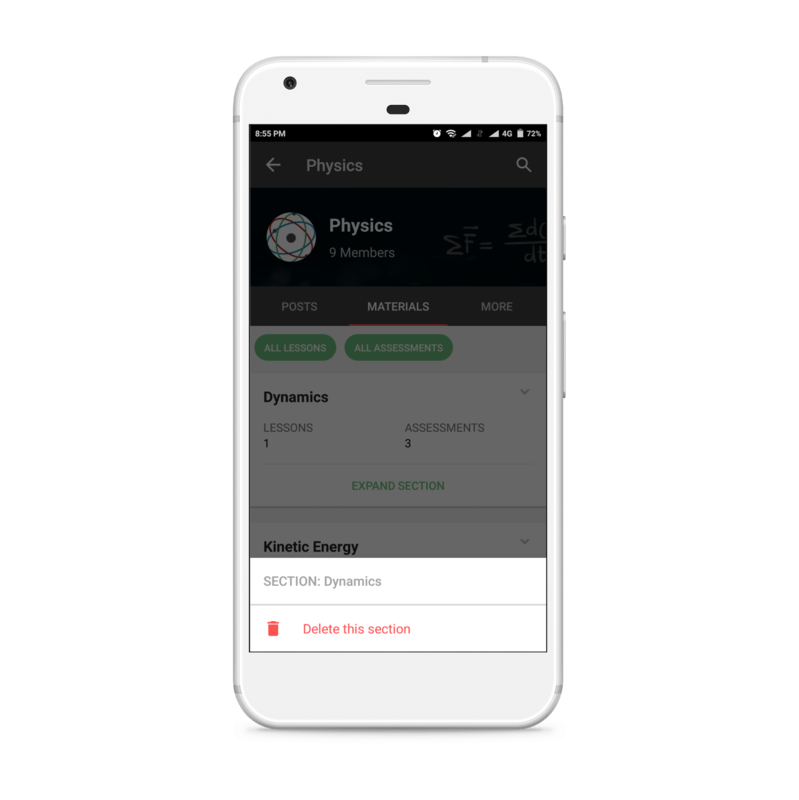 This update will be in sync with our recent updates aimed at improving user experience with the Sections, Materials and Lesson Listing screens. (read here). 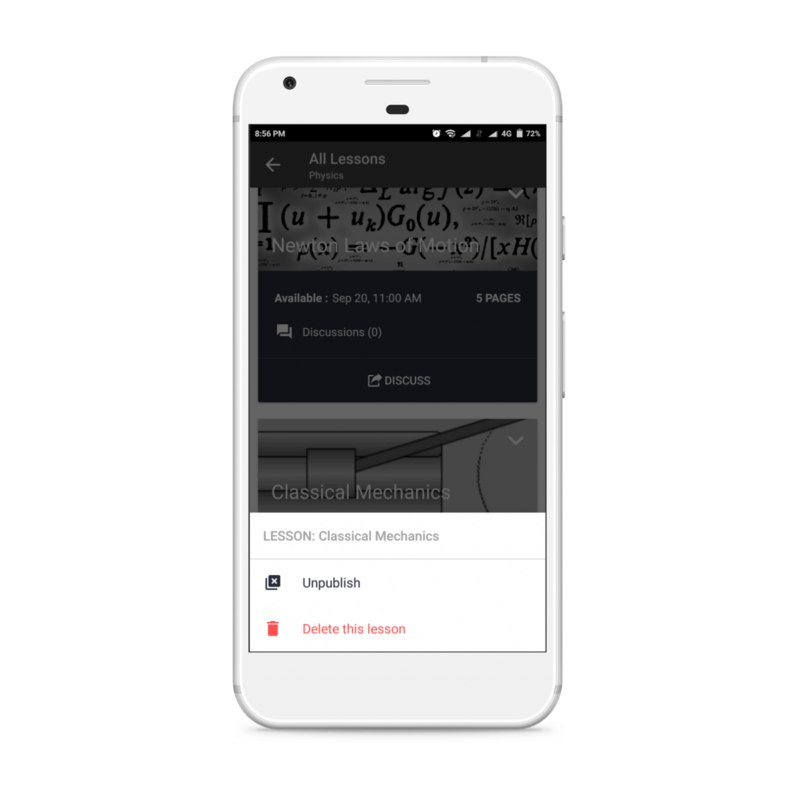 Next time you access a lesson, either from the lesson listing page, Materials screen or from any post it is tagged in, you will be taken to the new lesson landing screen. Apparently for different roles, different content will be shown on the aforementioned pages. Let’s take things forward one role at a time. 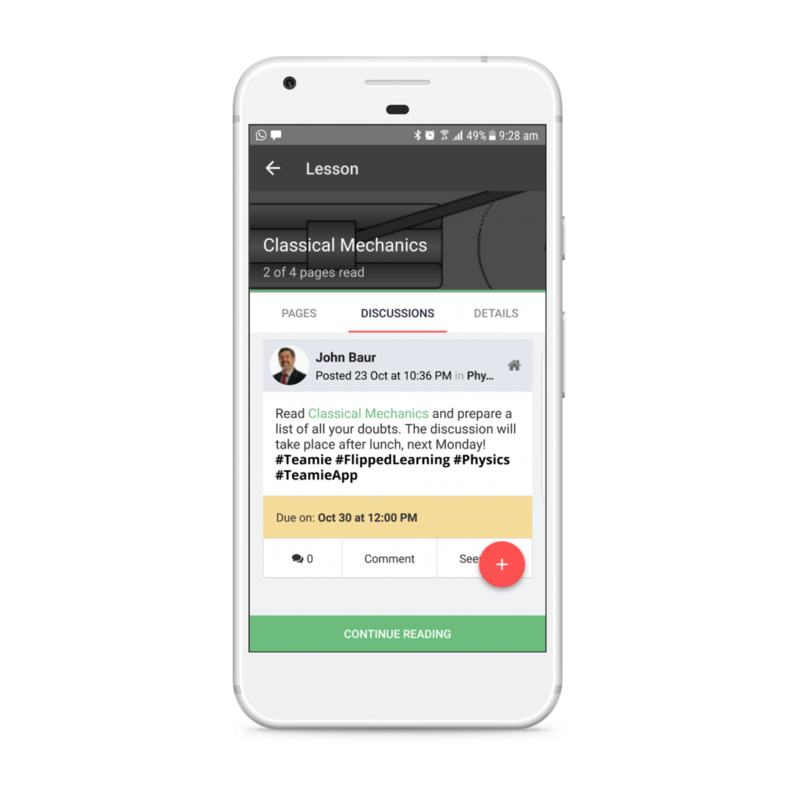 At the top of the lesson landing page, you will see the total number of lesson pages, including draft lesson pages. Below that you will be able to view the ‘From Date’ and ‘To Date’ details of the lesson as set by you. Further, you will see a donut chart depicting the number of learners who have not started reading, number of learners who are in progress and number of learners who have already completed reading the lesson. You can see all the lesson pages created for that lesson by scrolling upwards. Moreover, you can publish / draft lesson pages from this screen as well delete them, if you choose so! In case a lesson is in draft mode, then you will see a “Publish” button at the bottom of each tab to publish it quickly. 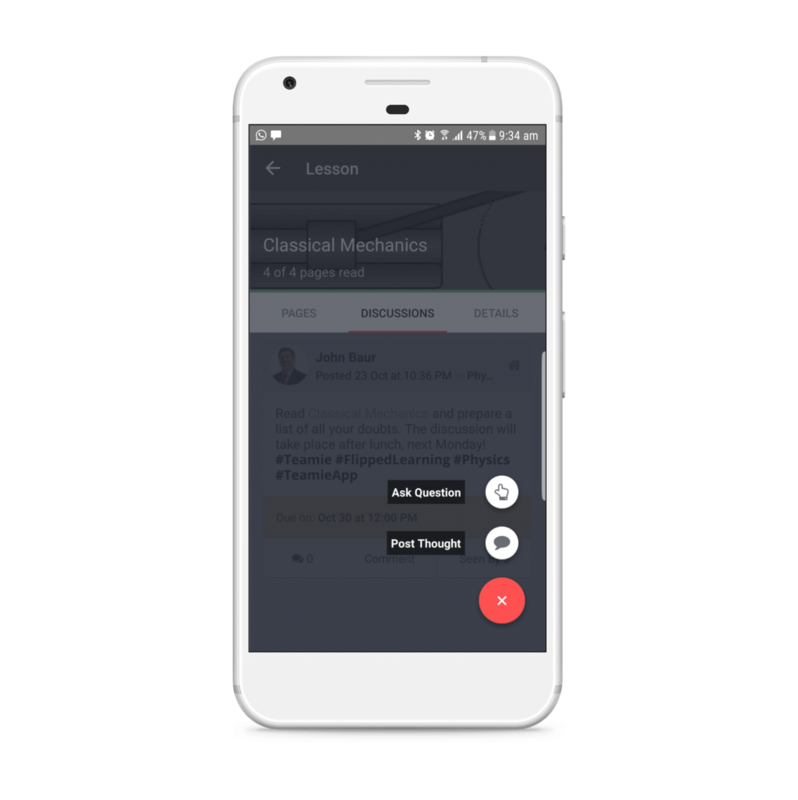 Discussions tab will list all the posts type (thought/question/task/announcement) in which the lesson resource is tagged. You can quickly start a new discussion by tapping the add button on the bottom right of the screen. 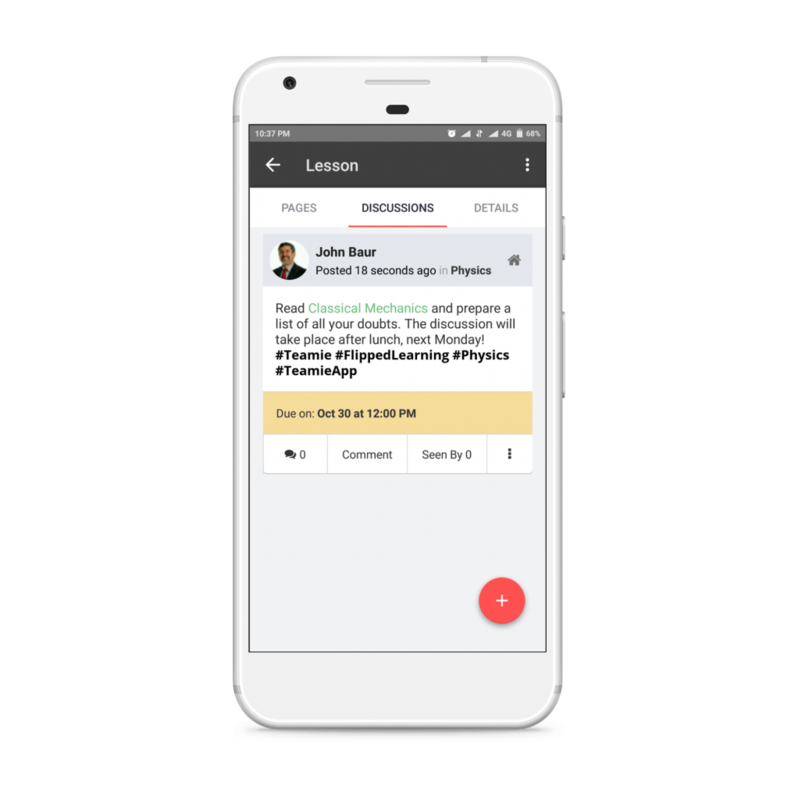 Details tab will list other pertinent lesson information, such as, lesson description, shared classrooms, and the lesson creator’s name. 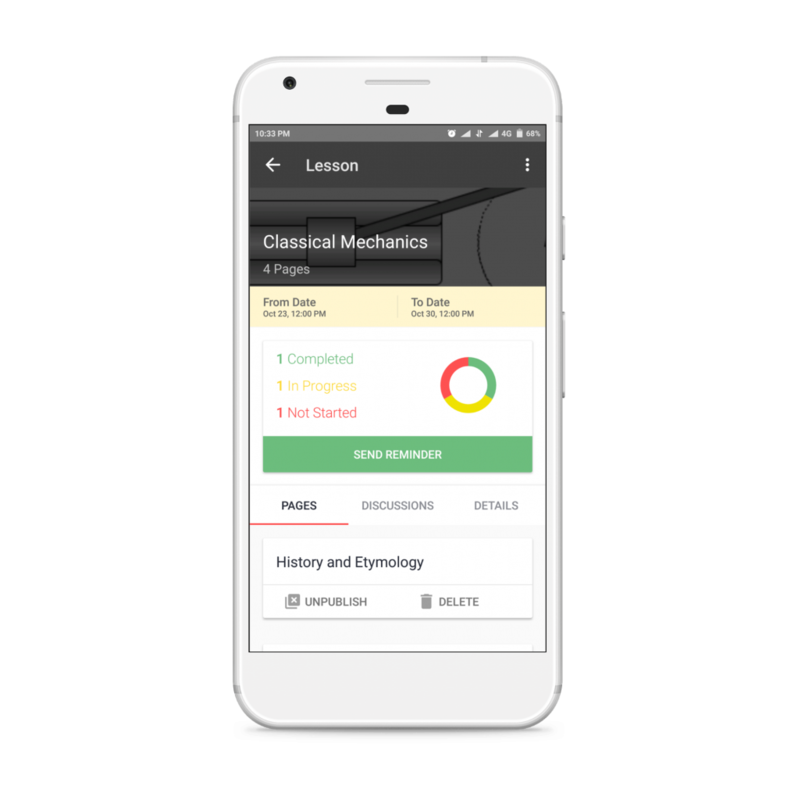 At the top of the lesson landing page, you will be able to see the number of pages read by you out of the total number of published lesson pages along with a green coloured progress bar to serve as a visual indicator of your progress. Below the Pages tab, you will see the list of all the published lesson pages. Once you read a lesson page, its text will be greyed-out and a green tick will be shown besides it. You can click “Continue Reading” to start reading the next lesson page. 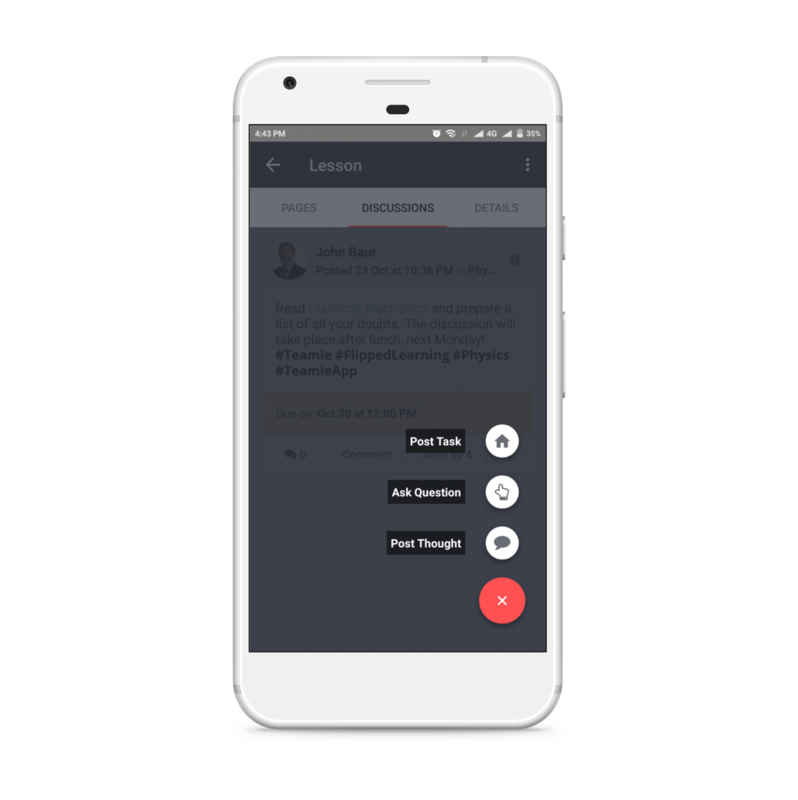 Similar to the instructors workflow, learners’ Discussions tab will also list all the posts type (thought / question/task/announcement) in which the lesson resource is tagged. 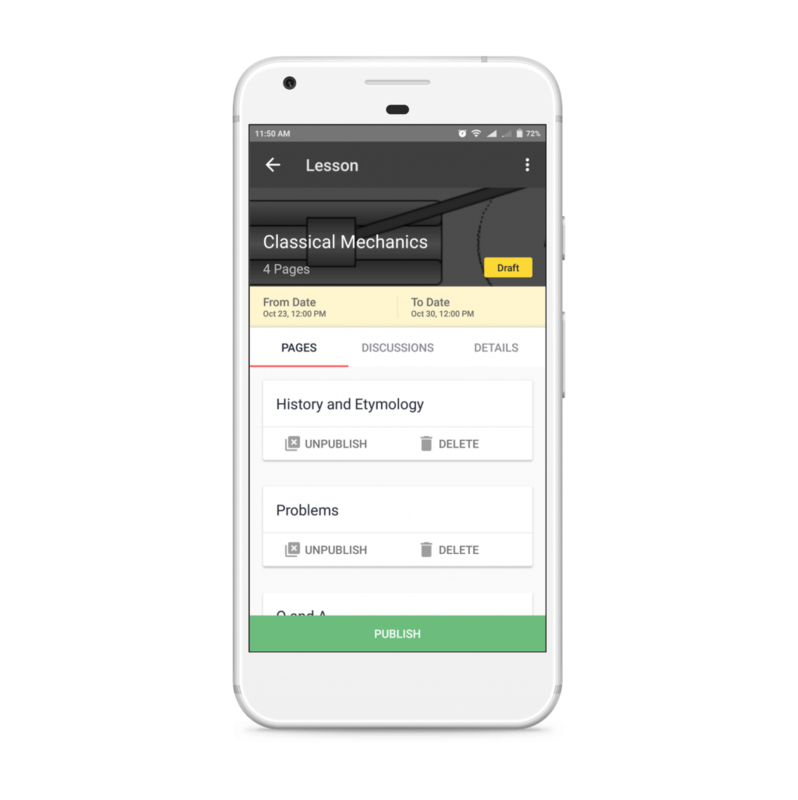 Details tab will list other information related to the lesson, such as, lesson description and the classroom(s) it is shared with. In an attempt to give instructors more control over their content management via Teamie app, we have introduced couple of cool new additions in the Teamie Android app. 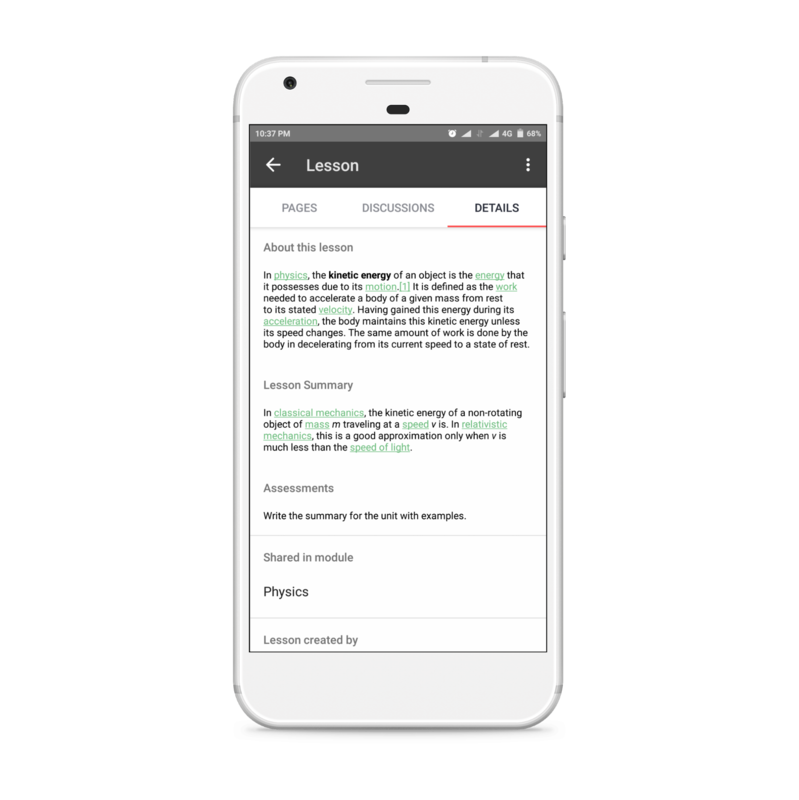 First one being a very handy addition of publishing or changing the status of a lesson to draft mode right from the lesson listing page in the app. The other one being, the ability to delete a section from the Teamie app. 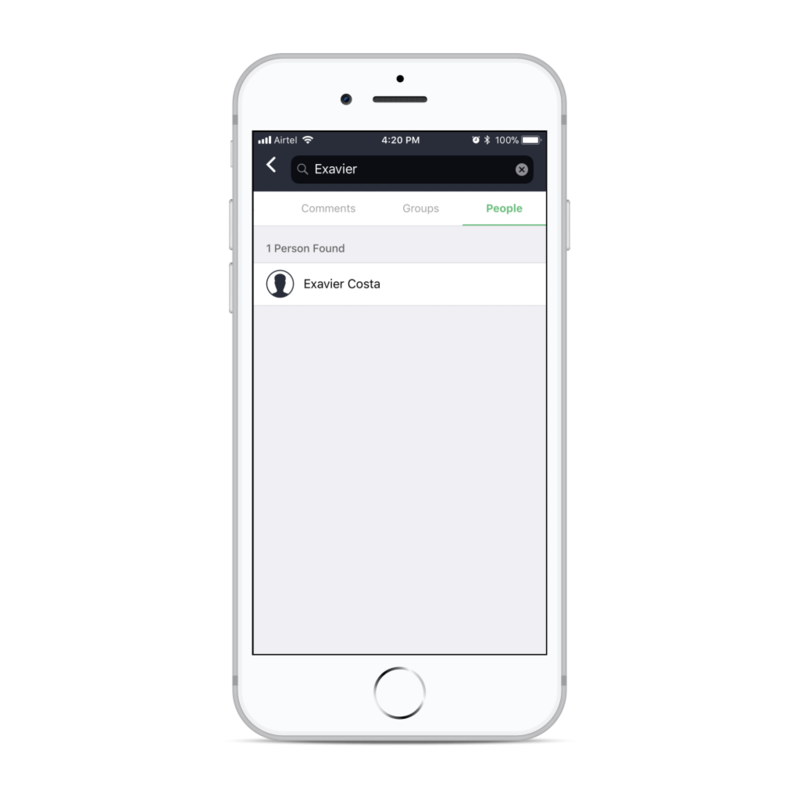 In the last Teamie app update 3.2, we introduced the search feature. 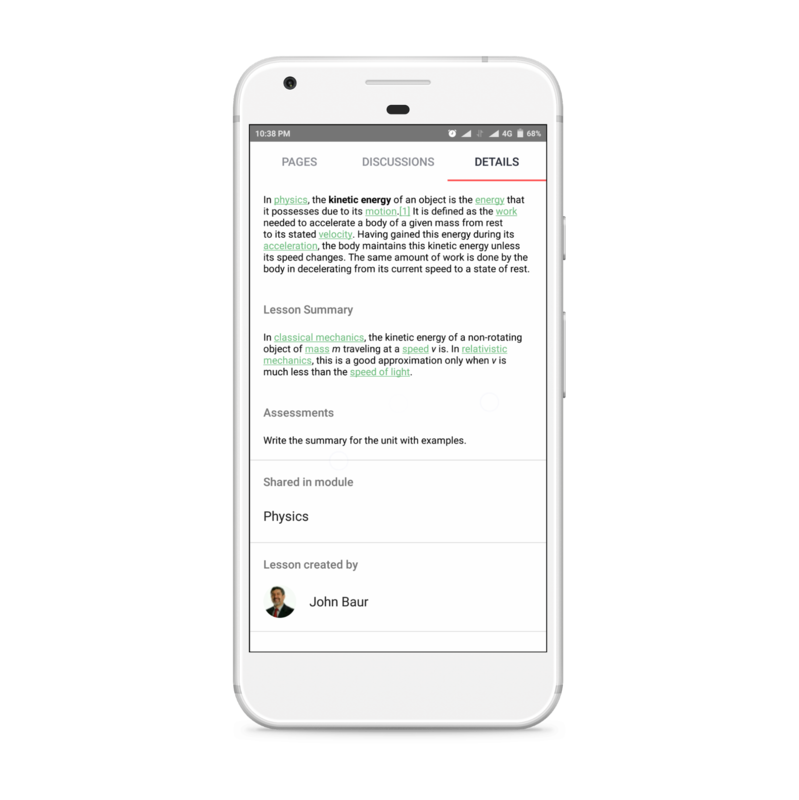 The search results were categorized in four tabs: Posts, Lessons, Comment & Replies, and Modules & Social Groups. We are happy to share that we have now added one more tab, the People tab. This separate tab is dedicated to searching users on the platform. Matching searches for users connected to you will show up in this tab. You can tap the relevant search result to navigate to that user’s profile.